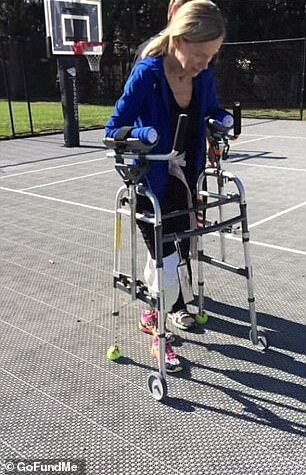 A quadruple amputee who survived a shooting has fought and won another battle: breast cancer. Julie Dombo, 64, of Derby, Kansas, said one of her daughters was giving her a shower in November 2017 when she found a lump. After 15 months of chemotherapy and radiation, doctors finally declared Dombo cancer-free, reported KSNW. 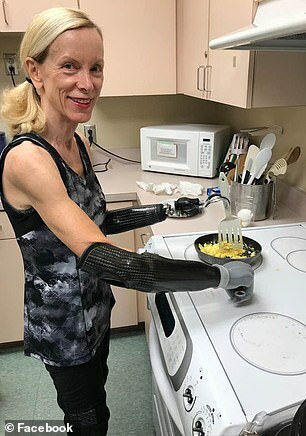 Despite the many struggles she’s faced since her hands and feet were amputated three-and-a-half years ago, Dombo says she wants to share her story to inspire others and show that they can live full lives post-amputation. Dombo said that when the biopsy confirmed her breast cancer diagnosis – she couldn’t believe it, especially after all the trials and tribulations she’d been through. ‘When I got down and out thinking: “God why are you doing this to me? Cancer too?”‘ she told KSNW. ‘But I just think God has been with me through all the amputations, and he is going to be with me through the cancer too,’ she says. In August 2015, Dombo’s world was completely changed in a robbery gone wrong. She was on her daily walk when she stopped by an AT&T store to get her phone fixed before heading home, according to the Wichita Eagle. Dombo was near the exit when a gunman fired at her after demanding money from clerks behind the counter. 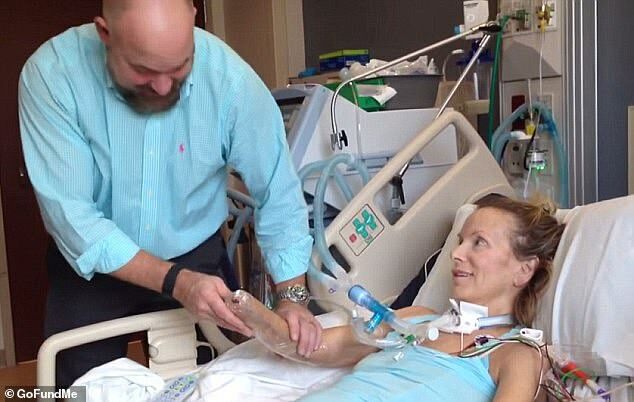 She was shot several times in the arm and in one of her lungs. Dombo was rushed to the hospital and was in a coma for six days. 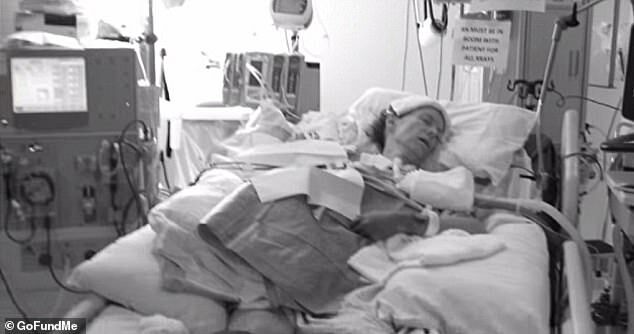 When she awoke, she realized she was on a ventilator and that both of her hands had turned black. 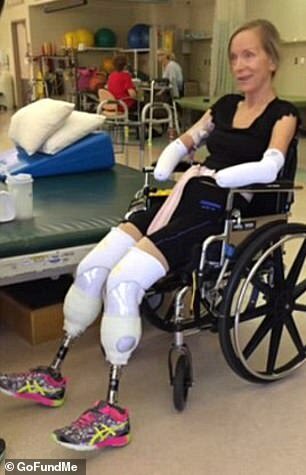 Doctors told her family that oxygen deprivation to her hands and feet had damaged the tissue and that all four limbs would have to be amputated. The gunman, James Michael Phillips, fled the crime scene but was later arrested by police. In December 2016, he was sentenced to 31 years in prison on nine criminal counts, including attempted first-degree murder. 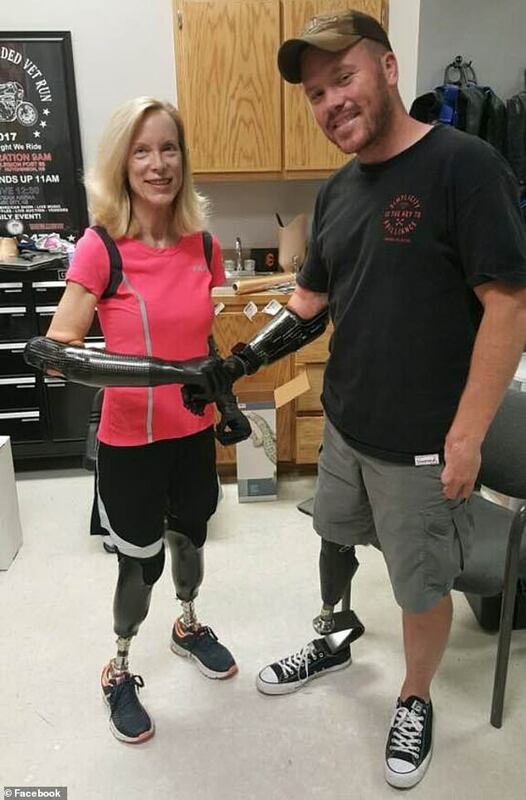 At the same time, told The Guardian she was in the hospital for nearly four months where she performed arduous physical therapy, learning how to navigate life in a wheelchair and how to use her prosthetic legs. 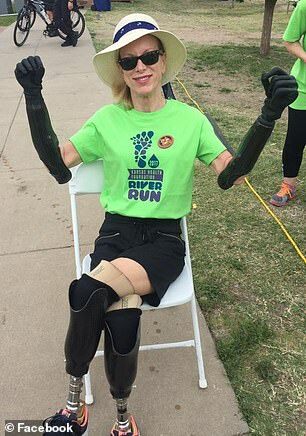 However, her insurance company – Blue Cross Blue Shield of Kansas – refused to pay for a pair of bionic hands, which were viewed as ‘luxury items’. Around Christmas 2016, a pair of generous donors gifted her with the $260,000 hands. They allow Dombo to grab and pick things up, dress herself, go to the bathroom on her own and even drive a car. 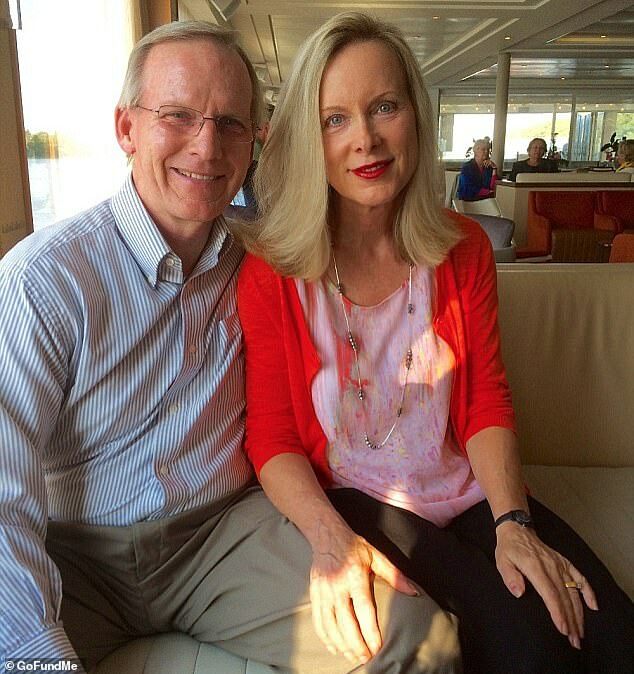 But tragedy struck yet again when, just one year later, she was diagnosed with breast cancer. The average US woman has a 12 percent chance of being diagnosed with breast cancer in her lifetime, according to the National Cancer Institute. In a Facebook post, Dombo revealed she underwent radiation therapy until July 2018 and received her final chemotherapy treatment last week. 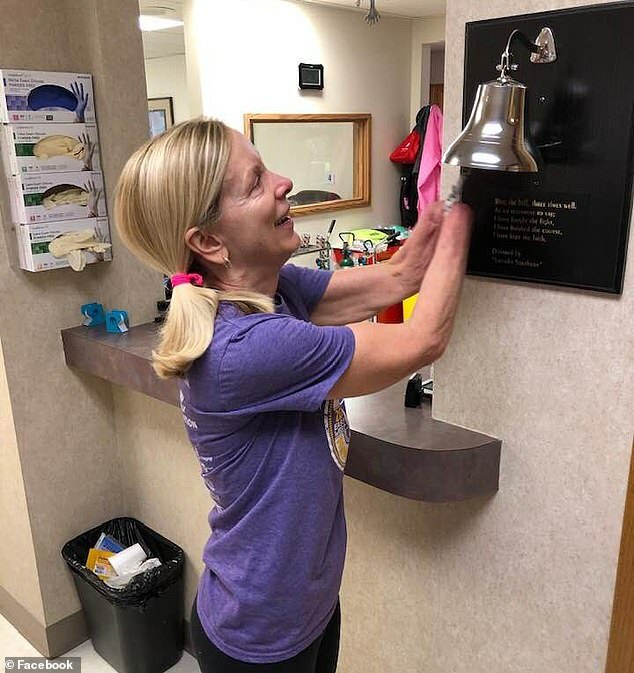 Accompanying the post, she shared a photo of herself ringing a bell, which many clinics have survivors do to mark the end of cancer treatment. ‘There is a little paragraph underneath the bell that talks about all the people before you who rang it,’ Dombo said.